2017 has been the year of slow but steady progress. Our documentary team has been chopping away at the 120 plus hours of footage. Our interns have been doing an amazing job to keep us moving forward and continually coming up with creative ways to make cut scenes work. In the process, we had a small technical set back when one of our drives crashed, but fortunately we had backups and we were able to restore our system without too much hassle. Our director Joe Anaya always tells the team: “Back up and back up often.” So, we are back, up and running. On a parallel path, we are currently also working with outside vendors for a composite of several shots to try and indicate the vastness of the ocean compared to Erden’s tiny boat and also a small temporary title sequence to give our update snippets a little more polish. Joe lives in Thousand Oaks a couple towns over from the fires which were raging northwest of Los Angeles, fanned by the Santa Ana winds exceeding 70 miles per hour. The Thomas Fire has now been declared the largest one in the history of California. Fortunately the fires which began on Dec 4th has very little active fire at this time. The fire is reported to be contained and hopefully it will be out in early January. We had our fingers crossed that that there would be no dramatic evacuation for Joe and family. In addition to saving their own lives, Joe would have had to grab the backup drives on the way out!!! Looking forward to our continued progress for the coming year with all the support of the people who believed in Erden and believe in the need for this story to be told. Its been a long time between postings and for this, we sincerely apologize. We have had some setbacks over the past year so production is moved more slowly than we would have liked. That being said, Joe has done a stellar job backing up all files and securing our footage. Additionally, he has enlisted the help of several fine folks who have sifted through hundreds of hours of film from Erden's 312 days on the Pacific ocean to capture the most compelling moments into bite size chunks of usable footage. We are also very close to finishing cuts for the first three years of Erden's travel. This is a huge psychological milestone for those in the cutting room. And we could not have gotten this far without the fine support of our awesome interns. We'd like to recognize Taylor Tubbs, Rebeca Bonilla-Myers, Emily Christian, Sarah Robles, and Matthew Waxman for their perseverance on this project. A big public THANK YOU to all of you who have contributed to our progress thus far. Joe is also making progress with his network of documentarians and vendors. There us a vibrant documentary community in Los Angeles and hopefully we will be able to utilize these resources when the time comes. Joes often says, "If Erden can suffer the hardships or traveling the world by human power, then we can certainly endure all the wading through footage he took along the way." It is taking time, but we are persevering, one day at a time. We can't say enough how much we appreciate the dedication of our friends and supporters. This project is a labor of love and we intend to see it through, no matter how long it takes. A brand new year is upon us and we wanted to start 2015 sending best wishes to all our friends and supporters. We have been quiet for a while, so an update on progress with the documentary is long overdue. We previously announced the successful conclusion of our Kickstarter campaign. Since then we held the much anticipated Argosy Cruise event on April 26th and mailed the swag items to our supporters (please let us know if we missed you in the mailing). We are grateful for the job Dannul Dailey did in leading the Kickstarter campaign that culminated in the well-received cruise event. We had nearly a full house as the Argosy Cruise toured on Elliott Bay. One of our Board Directors and Argosy Cruise Captain, Kevin Mullarky had promised to wear his official captain’s uniform, so the rest of our Board and officers also showed up in fancy attire. Fortunately Kevin did not have to be at the helm and could spend much of his time with us. As for progress in putting together the film, we have all the hardware and software – including backup protection – in place. Just getting all of the different types of video onto a single computer, into a useable format, and backed up was a huge task. Remember, Erden shot his footage on multiple cameras over years – in the time before GoPro. In total, we spent weeks and had to convert over 5,000 files into a file type that our editing software could easily read. After completing this, Joe recruited qualified help in Los Angeles to comb through over 120 hours of footage – which is painstaking work. Progress takes time. Once the existing film material has been fully reviewed and catalogued, we will be able to identify themes in the footage to be used in the final cut, while also identifying holes that will need to be filled by additional interviews, voiceovers and graphics. Expect some more updates in 2015 with our progress in this task. As for timetables, we’ve learned that this won’t happen as quickly as we had originally desired. That said, we are hoping for a rough-cut in 2015 and release in 2016. Please stay tuned – and let us know if you have any questions. We are less than 3 weeks away from our Argosy Dinner Cruise on April 26th where we will be showing select segments of the documentary, "Castaway with Purpose." It will give you a sample of what were working on and we anticipate a celebratory evening among friends and supporters. For those of you already registered for the cruise, we remind you that the boat boards at 6:30pm and departs at 7:00pm from Pier 56 on the waterfront in downtown Seattle. There is still availability to add to the guest list, so please contact Nancy Board at nrboard@msn.com for more information and how to get on board. I recently came across this photo of Erden on the sea. I liked it because he looks so adventurous. If you wanted to put a caption to it, what might that be? Erden Eruc. The man and the sea. This past May, I was coming to the end of a long year spent on the east coast. I was alone and away from my family, working through frustrating and depressing tasks. It was not one of the better times in my life but I was coming home, and that was positive. Yet, I didn't know what I was coming back to. I wondered if my kids would still remember me. I had grown a rather handsome handlebar mustache and my hair hadn't been trimmed for 12 months. There were many days when I didn't even recognize myself. I wasn't sure what I was going to do for work and it was scary. Soon after I returned to Seattle, my wife nixed my beautiful handlebar mustash and told me I needed a hair cut, as I was looking rather shaggy. So I called my old friend, Graeme Welsh, and set up an appointment. Graeme and I have been friends for 20 years now, since the days when I choreographed musicals and Graeme was a dancer in them. He was my barber then and has been cutting my hair every since. That hair cut would prove to be prophetic for me. While sitting there patiently, Graeme told me this story about his friend, Erden Eruc. He's cutting my hair and just chatting away. Then suddenly he gets very excited talking about an article in Outside Magazine that just hit the newsstands. It was a seven page spread on Erden and his successful circumnavigation of the globe, using only his own power and muscle. I remember then reading the article as Graeme talked excitedly and clipped my hair. The first thing I said to him when he finished was, "who's telling this guy's story? Surely there must be a documentary being made or a book…something." He said that's just it; no one was. He was frustrated for his friend because he knew the merit of such an incredible task and NO ONE was doing anything about it. I was shocked. I had to know more. And from that day on, I became obsessed with this story and this man. Who does that? What kind of a man undertakes that kind of a challenge and lives to tell about it? Graeme also said he was married and that intrigued me even more. Who was she? How did she deal with her husband spending five years of their married life away and in such unpredictable conditions? We created a Kickstarter fund raising campaign and set a target. It did well and we accomplished our goal, and more. We raised enough funds to allow us to begin assembling Erden's story. We've moved to an office space to work full time on the project. We've designed and created T-shirts, hats, a photo book, and this swanky web site. I recently sat down for a conversation with Erden and his wife, Nancy. I wanted to hear their story of how they first met. I'm really curious about their relationship and how it held together during this arduous global journey. Sitting side by side in the "war room" where I work on preparing the film, they seem intimately connected and comfortable. They sit side by side, close enough to each other to touch, less than an arm's length away. Her hand rests gently on his massive forearm, as a tender gesture of reassurance and support. There is a visible connection between them. It's palpable. I can feel it. I can see the love they have for each other in their eyes as they refer back and forth to one another. I see something deep…ocean deep. I can tell right away that this is a great love story. The journey that Erden has undertaken is quite spectacular in it's own right, yet it might be the "B" story to this connection between them. It may be that this entire five year undertaking is really about love. Maybe it's been there all along. Was it love at first sight? Indeed I've learned there was an immediate attraction they each had when first meeting in Chicago back in May, 2000. I was intrigued about how this relationship endured when half of their married life was spent apart. Erden was on his journey around the world and Nancy, although based in Seattle, was traveling extensively internationally for her job. As I watched them I thought maybe now they are making up for so much lost time. They are both keenly aware that life is a short proposition for all of us. It can and often does turn on a dime when we might least expect it. Whatever it is, it is lovely to see. It is warm, ingratiating and sincere. They finish each others sentences with ease. They appear linked in that way that two people have who still love each other. A telepathy of sorts. When they first met Nancy asked him what he did. Erden could have told her the standard line, "I'm an engineer. And you?" But instead he replied, "Would you want to know what I would rather do?" It's a great line, I have to admit. One I wish I had used in my college days myself. It would have helped my social life immensely. And of course, how could someone not bite at a question like that? So she said, "Ok. What's that?" "I'd like to travel around the world under my own power." I think most people would think, "Ok, no, but really." Not Nancy. She was instantly intrigued, thinking to herself, "what kind of person dreams that big?" She had never met anyone with that kind of aspiration. So here she was, standing beside this no nonsense guy, with a smile and a twinkle in his eye whenever he talked about adventure. She didn't hesitate...wanting to know more. From that point, life would change quickly for both of them. So in true adventuring style, they decided to marry in Homer, Alaska on June 15th, 2003, after Erden's ascent of Mt. Denali in late May. Prophetic in a way, I think of what was to come. After the ceremony, Erden would return back home to Seattle via bicycle, towing a loaded trailer with his climbing gear and all the provisions needed for the road. He would call this traveling "Göran-style," after fellow adventurer, Göran Kropp who had bicycled from Sweden to Nepal to climb Everest in 1996. Years later, at a different stage of their journey, Erden would record a message while at sea, under the moonlight, and send that message to his wife so many miles away. The Calderdale. The 24 foot row boat used by Erden to cross 3 oceans. Along side your typical row boat. Hello everyone and welcome! We are very excited to have our new web-site up and running and to post images and updates on all things documentary. A special thanks to Dave Marriott for designing a great site and plugging us in. It's been a busy time around here since we finished our Kickstarter campaign back in August. We are grateful and thrilled to begin funding this project with the money raised. Erden's story is such a rich story, not only from the global circumnavigation side of it, but from a personal side - the sacrifices one makes and the dreams one pursues. So now we get to tell this inspiring story and give back to all those who've followed and supported Erden along the way - all the unsung heroes out there. We are just finishing up with our new designs for a T-shirt and hat, and they look great. I love the T-shirts. The title, Castaway With Purpose floats above a sea of waves. The foreground is interwoven in the waves as is Erden's little yellow boat, with birds flying overhead - it's really pretty cool. The hats are almost completed. We'll be sending out a survey to all our backers soon to collect addresses for shipping. We're really excited to share this swag and get those out to you soon. Frenchman's Coulee near Vantage WA. 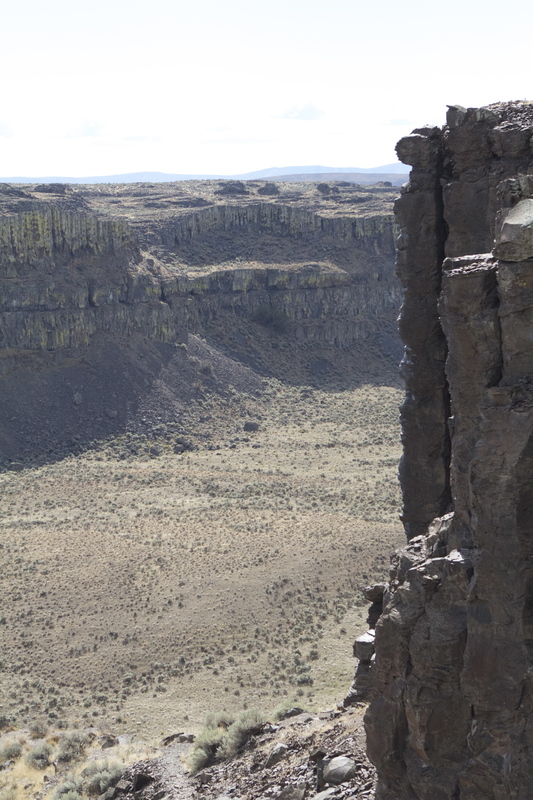 We recently spent a day filming at the Sunshine Wall at the Frenchman Coulee near Vantage, Washington. It was a hard day in many ways but great fun. Eric Browne, our DP, captured the day on a Canon C300, a truly beautiful camera. We met two climbers, Will and Stacia, who were gearing up for a day of climbing. We mentioned what we were doing and they immediately knew the story of Erden and Goran Kropp; what we were there to capture. Gracious and friendly, they were off and we wished everyone good luck. Later, when we reached the Sunshine Wall, Will and Stacia were just finishing up with a climb. The sun was brilliant and it was warm. I asked Stacia if she had one more climb in her and she said, "yeah!" So up she went. The crux. Stacia did it in style. 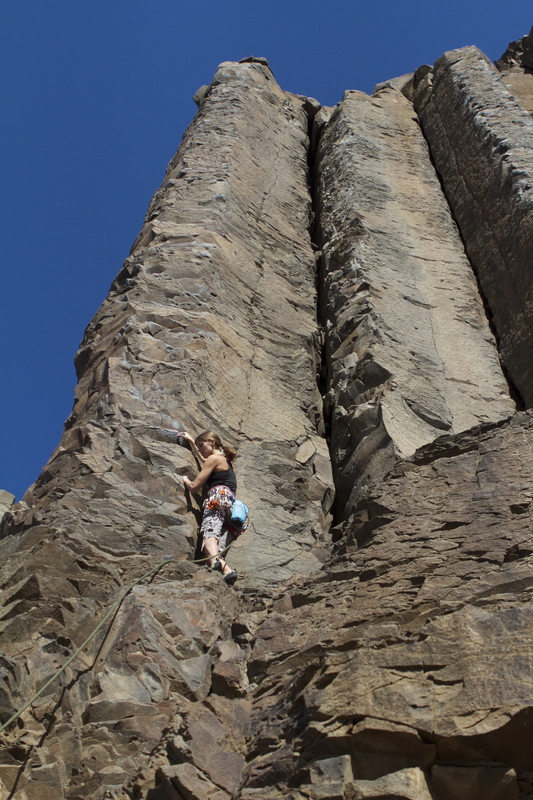 As she ascended, those of us not climbers, were on pins and needles, or at least I was. Stacia seemed to be right at home though, a walk in the park for her. Nearing the top I heard her struggling a bit, fighting muscle fatigue, grunting. But she made it to the top, supported by her belayer, Will. I suppose it was a bit of serendipity meeting up with them that day. Stacia, it turns out, is a reporter for a Tacoma paper who has a bi-line on things of adventure in the area. Eric Browne our eminent DP, and his mule. We are thrilled to have Eric Browne from Browne Productions on our team and so pleased he could join us that day to capture everything. His knowledge, experience, beautiful artistic eye and great disposition is a perfect fit for the team. We are thrilled to have him. Did I say that already? Graeme produced the days shoot like a champ, with grace and style, my brother, grace and style. Yeah, it was fun. We plan to go back and film more. 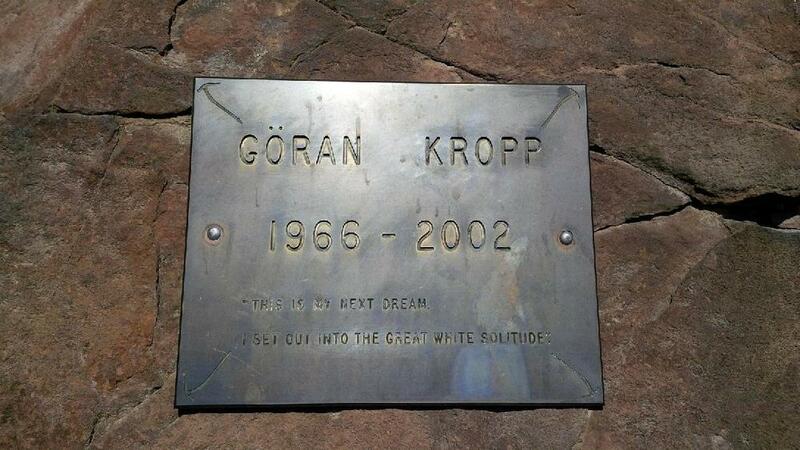 Below is a photo of the plaque that was erected in memory of Goran Kropp, the world renowned adventurer who fell to his death at the base of Air Guitar, a popular trad climb on the Sunshine Wall. Erden and Goran's story will forever be entwined at that spot. One life ended...and a new one began. Plaque at the top of Air Guitar at the Sunshine Wall at Frenchman Coulee. It reads: "This is my next dream. I set out into the great white solitude".